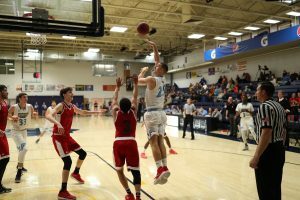 After a busy holiday season of games, the Utah State University Eastern Eagles squeaked by Colorado Northwestern Community College and won a nail-biter against The College of Southern Idaho. In the tournaments throughout December, the Eagles picked up more wins than losses. In the Wright Physical Therapy Shootout the Eagles went 2-0. In the Arizona Challenge the team went 1-2 and in the ICCU Invitational the Eagles went 1-1, including a 100-82 loss to no.15 Indian Hills Community College-Centerville. The Eagles recently started Scenic West Athletic Conference play with a game against Colorado Northwestern on Jan. 5. At halftime, the Spartans led USU Eastern 38-33, but in the second half the Eagles turned it on, outscoring the Spartans 49-37. “We stood our ground because we have to defend our home court,” sophomore Matija Novkovic said. “We had a couple of good defensive stops that led to easy transition points. On Jan. 12, the Eagles played no.13 College of Southern Idaho. At halftime, CSI held a 39-34 lead and in the second half they held steady and eventually expanded it to double digits. With six minutes left in the second half, the Golden Eagles found themselves down by 15, but kept chipping away at the deficit. The Golden Eagles eventually made it a close game again, and with seven seconds left, Nield made two free throws and the Eagles couldn’t make a last second shot, leaving Nield and the rest of the Golden Eagles speechless and overjoyed at the team’s incredible comeback. In the final tally, Nield again led the Eagles in scoring with 23 points on 6 of 17 shooting from the field and 8 of 11 shooting from the foul line. Pantovic chipped in 16 points on 7 of 14 shooting from the field and 1 of 2 from 3-point territory. One of the reasons that the Eagles were able to come back against a highly-ranked team is because of the bench play. Nield has been named the SWAC Player of Week after leading the Eagles in scoring as they upset no.13 College of Southern Idaho on Saturday night. This marks the second time Nield has earned conference player of the week honors this season. The Eagles’ next game is at no. 9 Salt Lake Community College, the game will be on Jan. 17 at 7:30 P.M.